A year ago, in a televised address to the nation, Enda Kenny told us: “I want to be the Taoiseach that retrieves Ireland’s economic sovereignty”. 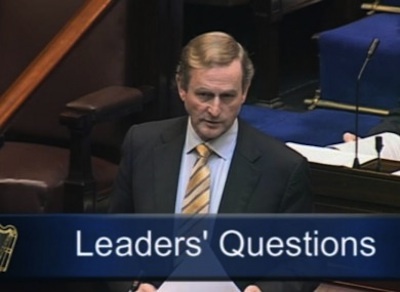 He told an audience in Chicago in March 2012 that Ireland would regain its economic sovereignty by the end of this year. He told a Fine Gael conference last month that Ireland was on course to “retrieve our economic sovereignty and independence”. That promise is an illusion. The Lisbon Treaty, for which Enda Kenny campaigned, copperfastens Ireland’s surrender of sovereignty to the EU forever, a surrender we sleepwalked into in 1992 in ratifying the Maastricht Treaty. Ireland is obliged to avoid what is known as “excessive government deficits”, not just now but forever. In that connection the European Commission has indefinite authority to “monitor” our fiscal arrangements and if we get out of line, there may be consequences, including daunting fines (article 126 in what is now known as the “Treaty on the Functioning of the European Union”, a consolidation of several treaties). Specifically, in the case of member states that are members of the euro group, there are special requirements. “In order to ensure the proper functioning of economic and momentary union . . . The Council [of Ministers] shall . . . adopt measures . . . to strengthen the coordination and surveillance of their budgetary discipline [and] to set out economic policy guidelines for them, while ensuring that they are compatible with those adopted for the whole of the Union and are kept under surveillance” (article 136). So the surveillance to which we have been subjected to under the bailout will continue indefinitely, not as intensively perhaps, but surveillance, forever. Ireland is required to join in the coordination of economic policy across the EU and the European Commission has permanent sanction to monitor what is happening. If the commission is dissatisfied with our compliance, it may address a warning to us and further consequence may flow if we do not comply (article 121). And not just economic policy, we are required to coordinate strategies on employment (article 145). All this within the overarching ambit of the “principle” of “an open market economy, with free competition” (article 120). The rhetoric of Euro-speak includes supposed concern for “exclusion”, “social solidarity” and “social cohesion” but in the last decade even the rhetoric has been modified as the cruder features of neoliberalism have become embedded in the ethos of the EU, which, anyway, was all about free markets or rather a single free market from the outset – the mumbo-jumbo about bringing peace to what had been a war-ravaged Europe was also just spin – it was the Cold War that brought peace to war-ravaged Europe. Neoliberalism has been described by the anthropologist David Harvey as: “a theory of political economic practices that proposes that human well-being can best be advanced by liberating individual entrepreneurial freedoms and skills within an institutional framework characterised by strong private property rights, free markets and free trade” – inevitably, it propels societies towards the vast enrichment of an elite and relative destitution for many. We were never asked to vote for this agenda, we never ordained it but we did sleepwalk (again) into ordaining an arrangement whereby democracy (such as it is) is confined to member states and the institutions that now control us are now, effectively, beyond democratic control or even supervision. But the loss of sovereignty is even more comprehensive than this. We have capitulated to multinational corporations. For instance, one of the reasons for the price of prescription drugs being far higher here than elsewhere in Europe is because of deference to the pharmacological multinationals. Almost our sole bottom line with the EU is an insistence on maintaining our 12.5 per cent corporation tax rate, yet another capitulation to multinational corporations. Our trepidation in responding to the revelations about Ireland’s tax haven status was more of it. And, along with that, our pusillanimity in handling the carriage of armaments through Shannon airport and the trafficking through that airport of rendition captives, by US armed forces, was part of it – not so much deference to the US government, more so to US corporations. But perhaps the most striking manifestation of our surrender of sovereignty has been on our support for the EU banking system. The two Government parties had a mandate from the Irish people to undo the guarantee to the bank bondholders and to insist on “burden sharing” of our bank debt. We now know that in the early days of this Government in office, they caved in on that commitment in the face of a threat by Jean-Claude Trichet of “terrible and immediate war” (in the words of Michael Collins). An exit from the bailout will be heralded as a triumphal restoration of Irish sovereignty and independence. It will be no such thing. Just more spin.